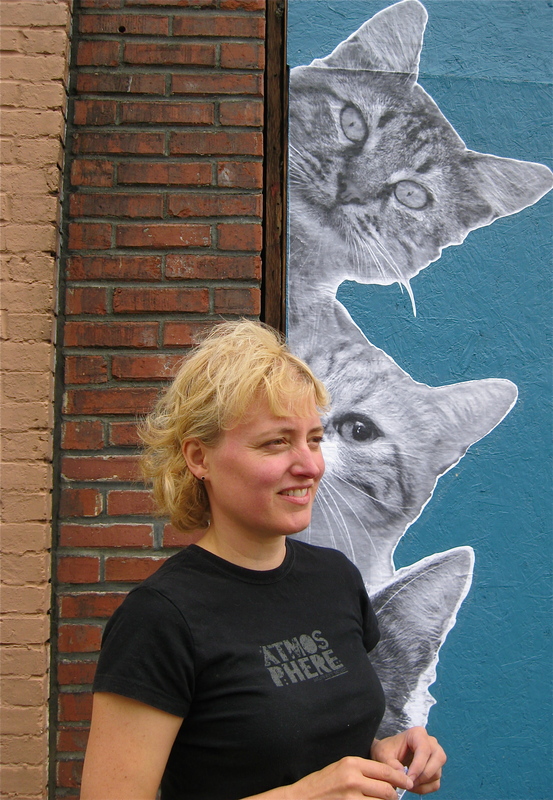 Mindy Barker installing “Humans, Join Us”, a collaboration with Kristin Giordano. There’s a new and noteworthy art venue shaking up downtown Tacoma: The Market and South 11th Street Building. In a joint initiative in June, Spaceworks and transportation advocate Downtown on the Go invited local artists to submit ideas for transforming the exterior of this long-vacant building into an outdoor exhibition space that would engage downtown commuters and pedestrians alike. 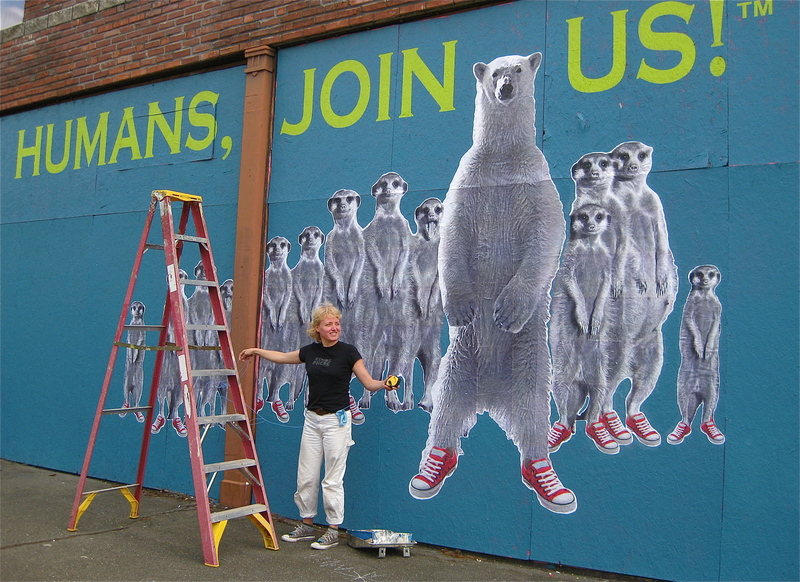 Just three months later, the results are overwhelming: three wall-size murals – by Jeremy Gregory, the creative duo of Kristin Giordano and Mindy Barker, and a team of artist-poets from Write@253 – have invigorated a drab gray block into a vibrant urban landmark that has passersby circling for a second look. With a skin of art and poetry wrapping around three sides (the fourth is shared with an adjacent building), the vintage structure is akin to an architectural Rubik’s cube, inviting inspection from most any angle. The literary and visual artists were commissioned to create art on a transportation theme, but the writers were invited to expand beyond transportation to write about life on the busy streets of Tacoma. Cattin’ around: artist Mindy Barker. Barker and Giordano took over the Market Street wall with their whimsical work, Humans, Join Us! ™ Starring in this inter-species drama are larger-than-life meerkats, a towering polar bear, and other wild and domestic creatures – most shod in red sneakers, some sporting skateboards or other self-propelled modes of locomotion. According to their project proposal, the artists sought to convey a message that was “accessible, humorous, playful and contemporary,” while making the point that it is the human species whose movements leave behind a destructive carbon footprint. The playful yet powerful animal images were printed on paper and hand-transferred to the wall with weatherproof adhesive. The spaceships have landed: Jeremy Gregory’s South 11th St. mural. Around the corner, on South 11th Street, Jeremy Gregory looks to other galaxies for an antidote to man’s fossil-fuel follies in a mural entitled A to B. This super-smooth duo-tone painting marks an elegant departure from the magazine comics and illustration, and raw street-habitué puppets, he is known for. “It’s about movement, A to B,” he says in a phone conversation. But not the kind devised by your friendly local department of transportation. The public routing in this painting infers airstreams based on mathematics and computer circuitry – an unimpeded higher intelligence – rather than primitive traffic grids. Gregory’s aliens are painted in black silhouette on a smog-colored background; the scene has such fluidity it seems the beings could simply float over toxic emissions and outmoded traffic snarls. “The shapes loosely represent different [types] of transportation and commuters,” he says. “Imagine organic shapes connecting with each other at points that spiderweb into other connections. This network…starbursts continuously, creating a mapping” of unhindered movement. A repeating coin shape echoes an interstellar wormhole, a transportation hub, or a subway token. An alleyway is a loaded symbol: to some it beckons irresistibly with its strangeness and dark corners, to others it shouts, Keep Out. For the young scribes at Write@253, the alley on South 11th St. & Court C provided an inspired location for a poetry mural. 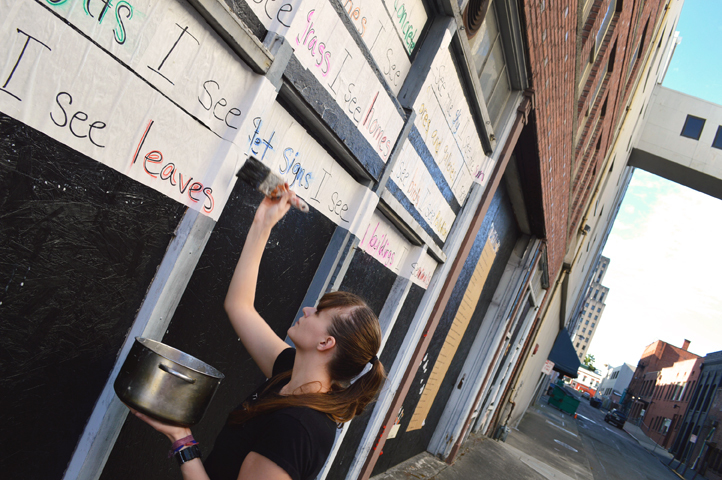 “It would be amazing for a kid to see their work on a building passing by,” adds Write@253 Coordinator Mary Fox. A community-based literacy center that grew out of a Spaceworks Creative Enterprise, Write@253 provides one-on-one tutoring and workshops to students K-12. My sidewalks make concrete a red carpet. like we were never hurt…. 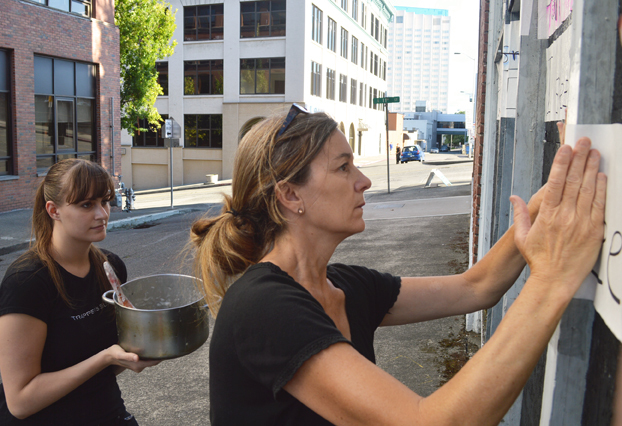 Initially, the organization applied for one of the streetside mural locations, but were turned down because of concerns that poetry would be distracting for drivers and require too much time to read. When the alley was proposed as an alternative, it made perfect sense, says Fox, not least of all because of its poetic associations. Given the location, the artwork will likely attract graffiti. But this could actually add a layer of interest, says Loete. “It depends on what [the taggers] add. 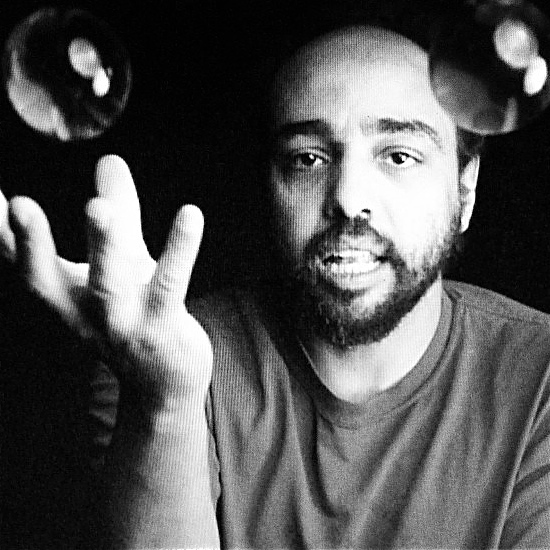 We would love positive contributions, especially positive poetic contributions.” The group plans to rotate poems over time. 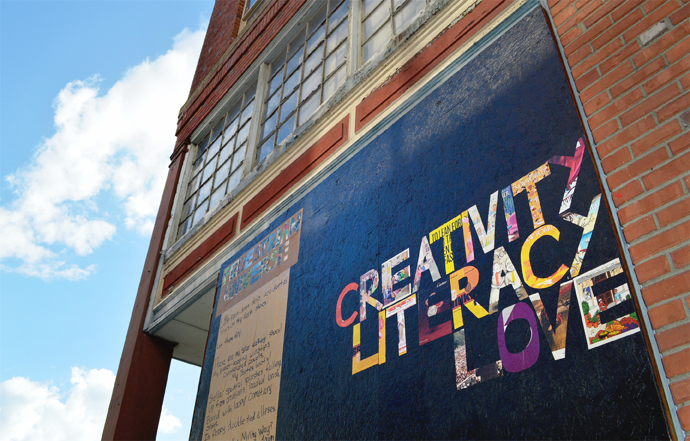 Word-based art projects have sprouted on buildings across the US, and in countries the world over including Kazakhstan, South Africa, Argentina, Holland, Japan and Portugal. Write@253’s effort will be the subject of an article in wrist, a literary magazine.